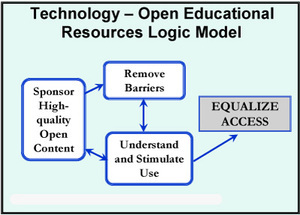 Open University "OpenLearn": MIT with pedagogy, or MIT without the completeness? In March I reported on the Open University's announcement that it would be making some of its content "open", supported by a large grant from the William and Flora Hewlett Foundation. In July I included a summary from a presentation I attended by Jason Cole and Martin Dougiamas about the OU's use of Moodle. Since then progress has been swift and impressive. On 25/10/2006, the OU launched OpenLearn "free and open educational resources for learners and educators around the world". [Hewlett Foundation media release.] Yesterday I heard a presentation to the HEFCE "eLearning Partnership Board" (on which I represent ALT) by Professor David Vincent, who is the OU pro Vice Chanceller responsible for the initiative. "surveys the new generation of the web, reviewing and providing in-depth walkthroughs of today's best products and services. Owned and maintained by 19 year old Brian Benzinger, Solution Watch aims for writing quality reviews of products and services that are of benefit to its users." Today Solution Watch published the 3rd and final in a series called "Back to school with the class of Web 2.0". The series contains numerous short reviews of mainly free web-based tools for teaching and learning. Part 1 - 29/9/2006. Part 2 - 6/10/2006. New Zealand's Open Source ePortfolio Project. Guest Contribution by Meredith Henson. Meredith Henson is eCDF ePortfolio Project Manager based at Massey University in Wellington, New Zealand. The ePortfolio Project is charged with developing an open source ePortfolio application and to provide implementation strategies for the New Zealand tertiary sector. We are however developing the system with consideration to an international focus and appeal. This project is a collaborative venture funded by New Zealand’s Tertiary Education Commission’s e-learning Collaborative Development Fund (eCDF), involving Massey University (lead provider), Auckland University of Technology, The Open Polytechnic of New Zealand, and Victoria University of Wellington. On 26/10/2006 EDUCAUSE (which has around 2000 mainly US institutions and 200 businesses in membership, and which plays a similar role in the US to ALT, UCISA, SCONUL, and parts of JISC and JANET rolled into one and grown in size) released the full text of an unprecedently no holds barred letter to Blackboard Inc. concerning the Blackboard patent, originally delivered to the company on 9/10/2006. "Our community has participated in the creation of course management systems. A claim that implies this community creation can be patented by one organization is anathama to our culture." "We believe that Blackboard should disclaim the rights established under your recently-awarded patent, placing the patent in the public domain and withdrawing the claim of infringement against Desire2Learn. We believe this action would be in the best business interests of Blackboard and in the best interests of higher education. We do not make this request lightly or underestimate the courage it will take to implement. However, we believe it is the right action for your corporation and our community." "Blackboard has been (and remains) a long time supporter of Educause and the important role it plays for the academic community, but we are disappointed that Educause, an industry organization, is taking public positions on its members' intellectual property and enforcement efforts. We are proud of our innovations and believe protecting Blackboard’s intellectual property is tantamount to the success of the company and the evolution of the industry at large." 26 July 2006 - Blackboard's US Patent 6988138. 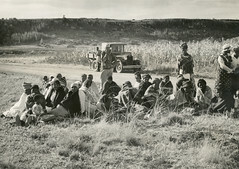 This picture of women waiting by a road near Morija, taken by my dad in Lesotho in about 1938, is one of 22 black and white prints from a family stash that I just had scanned. The continuation post contains all 22 in a short Flickr slideshow. In 1985 I visited my uncle Kent in Mercedes, Uruguay. He showed me the "log book" from what was, in effect, a "community of practice" that he and a group of 7 other local small farmers had established. The basic approach was that participants paid each other facilitated exchange visits at which they reviewed and critiqued each other's farming practices. For some reason, what he showed me stuck in my mind. Nearly 20 years later this simple model was built into a small scale project (with a focus on e-learning rather than agriculture) involving 2 English Universities (Greenwich and Staffordshire) and 2 English Further Education Colleges (Loughborough and Leeds College of Technology). The project, called CAMEL, was funded by the HEFCE Leadership, Governance and Management programme, and jointly run by ALT (for which I work half time as Executive Secretary) and JISCinfonet (a JISC service), with the support of JISC and the Higher Education Academy. A 30 page project report is now available. This tries and largely succeeds in getting to the heart of how to establish and sustain an inter-institutional collaboration, whether or not that collaboration is about e-learning. You can download it as a 1MB 32 page PDF. There's also this presentation about the project, from 2008. Paul Duguid and Nicholas Carr on the lack of quality in "peer production"
Serendipity is the gift of finding useful things unexpectedly by luck, and it is amazing how often you find important stuff by browsing as well as by searching. My route to Paul Duguid's October 2006 essay Limits of self-organisation: peer-production and the "laws of quality" was via Alfred Essa's The NOSE and Nicholas Carr's Rough Type, where there is a thorough and readable review of the essay. "People often implicitly ascribe the quality of peer–production projects such as Project Gutenberg or Wikipedia to what I call “laws” of quality. These are drawn from Open Source software development and it is not clear how applicable they are outside the realm of software. I look at examples from peer production projects to ask whether faith in these laws does not so much guarantee quality as hide the need for improvement." "But one comes away from this excellent paper wondering whether, once these "other ways" of quality assurance are imposed on a process, it would still qualify as "peer production." As Duguid eloquently demonstrates, quality doesn't just happen; it's not an emergent phenomenon. It's imposed on a work by people who know what they're doing. Quality - true quality - may thus be incompatible with the democratic ideal that lies at the heart of what we call peer production." encourage you to read both of them. Eye tracking: "climbing inside your users' heads and seeing your web site through their eyes"
"The article argues that it is necessary to move e-learning beyond learning management systems and engage students in an active use of the web as a resource for their self-governed, problem-based and collaborative activities. The purpose of the article is to discuss the potential of social software to move e-learning beyond learning management systems. An approach to use of social software in support of a social constructivist approach to e-learning is presented, and it is argued that learning management systems do not support a social constructivist approach which emphasizes self-governed learning activities of students. The article suggests a limitation of the use of learning management systems to cover only administrative issues. Further, it is argued that students' self-governed learning processes are supported by providing students with personal tools and engaging them in different kinds of social networks."